BroMenn Comfort and Care Suites (BCCS) is a post surgical recovery care center. There are only 6 other recovery care centers in the state of Illinois. Currently the state of Illinois will not grant any other Certificates of Need (CON) for any other Recovery Care Center in the state. BCCS will be the only RCC in McLean County. BCCS has three private and comfortable suites, Heartland Suite, Tuscany Suite and Scottsdale Suite. Each luxurious suite is set up similarly with a patient bed, a chair bed for a guest, large LG flat screen TV, wardrobe, private bathroom with shower, and an outer sink with granite counter top and mirror. Each suite has large windows with 2 inch wood blinds and a vaulted ceiling. The BCCS has a lobby that has a gas fireplace with cultured stone. The lobby has the feeling of your own family room in your home. Patients that will be staying in the BCCS will be able to check into the BCCS and stay in the lobby or their personal suite until it is time for surgery. Their family is able to enjoy the smaller, quieter atmosphere of the BCCS verses the busier SurgiCenter lobby. BCCS is owned by The Center for Outpatient Medicine, LLC. It is a joint venture between BroMenn Regional Medical Center, Carle Foundation, McLean County SurgiCenter, and 17 local surgeons. 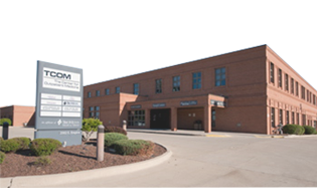 BroMenn Regional Medical Center holds the majority of the ownership within the BCCS. BCCS has a food permit with the McLean County Health Department. Each patient, as well as their guest, will be served an equivalent to three meals. BCCS is a wonderful option for patients that need additional observation and/or pain control after surgery up to 48 hours. All patients have to be cleared by anesthesia to be qualified to stay in the BCCS. Patients with a known active and infectious condition will not be allowed to stay in the BCCS, which means that the chance for infection to patients of the BCCS is very low. Ask your physician if you can stay at BroMenn Comfort + Care Suites!